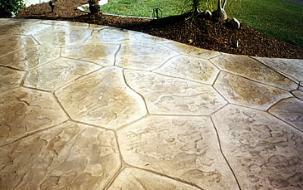 Stamped concrete is a great way to enhance the beauty of your home or business. Stamped concrete is very versatile, allowing you to custom design a walkway, driveway, patio, pool deck, interior floor, subdivision entry way, golf-cart path and anything you can think of for your home or business. The commercial uses of stamped concrete are endless. Stamped concrete is a great interior substitution for ceramic tile and carpeting, as well as replacing exterior pavers or plain concrete. About - Stone Images Concrete - Serving Northern Virginia - Fairfax, Loudoun, Arlington, Alexandria, Falls Church, Springfield, Burke, Leesburg, Manassas, Woodbridge, and more. Also serving Washington DC and Maryland. Please visit our Gallery and scroll down to view our Flagstone and Paver Patio pictures. We have also added new Fireplace and Grill photos. Stamped Concrete, Flagstone, or Pavers? Call us and we will help you decide. Let our competent professionals improve your living space. Call us today! Suggestions, Complaints or Compliments about this website - please give us a call.